Makita’s new heavy duty 230mm DGA901ZUX2 18Vx2 brushless angle grinder LXT has the benefit of advanced technology allowing connection via Bluetooth to compatible dust extractors. This new model is powered by twin 18V Makita Lithium-Ion batteries to provide 36V power to the high torque Brushless motor which benefits from greater performance and runtime. Delivering up to 6,000 rpm with a max wheel thickness of 6.5mm the new DGA901Z delivers mains machine performance with the great advantage of total manoeuvrability. A variety of technical features, especially in the machine’s electronics, ensures maximum operating productivity and simultaneously affords a high level of protection for the machine and its operator. In addition to Makita’s active feedback sensing technology (AFT) which shuts down the tool to protect the user if the rotation speed suddenly slows down, this model also features Makita’s automatic torque drive technology (ADT). This function automatically changes the cutting speed according to working conditions, to ensure optimum operation and maximum delivery. Now, Makita’s auto-start wireless system (AWS), which features in many of Makita’s intelligent machines, allows connection to compatible dust extractors via Bluetooth helping to satisfy the industries requirement to meet continually increasing standards of site safety. The AWS system will automatically start the extractor via wireless connection when the power tool is switched on, reducing the risk of trip hazards on site. There is no other angle grinder on the market with higher credentials. In addition, this angle grinder includes the soft-start system that reduces risk for torque twist on initial start-up, and the electronic current limiter that also shuts down the tool through the electric brake if the drive is snagged. These are coupled with the anti-restart function which requires that the control switch is returned to the Off position and then back to Run before the grinder will activate. Should the machine be left in the ‘on’ position when the batteries are removed for charging, the same safety system is triggered to prevent the machine from starting up automatically when the batteries are reconnected. The new twin 18V Makita DGA901Z weighs a comfortable 5.2kg without batteries, has an ergonomically designed soft grip handle, and a large trigger with lock-off function conveniently placed on the slim body housing. The side handle can be fitted on either side of the tool and a strong battery guard adds extra protection in tough environments. Vibration levels are low at just 7.5 m/s² for surface grinding and 2.5 m/s² for disc sanding. The DGA901Z has an electric brake and battery indicator for over-discharge and over-heating protection, and is available as a body only machine. 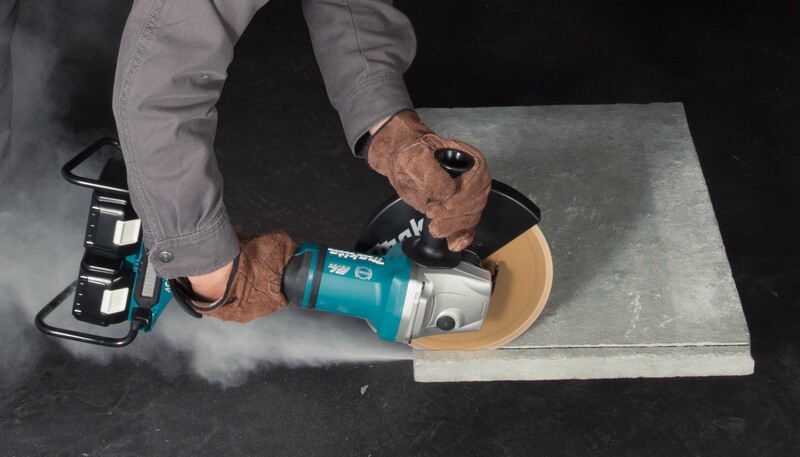 Makita has a comprehensive range of top quality grinding wheels and sanding discs to compliment the high performance of this new LXT angle grinder.